We also arrange tours for guests. Quietly nestled in the heart of Palawan's Tropical Paradise, Puerto Princesa City, D'Lucky Garden Inn and Suites will delight you with it's unique charm, tranquil gardens and friendly atmosphere. We are committed to providing our guests with the highest standard of service possible, affordable accommodations, superior cleanliness in a quiet and traditional guest house atmosphere. We are located 3 minutes from the airport of Puerto Princesa City, Palawan and 5 minutes from the nearest beach resorts, bars and malls. 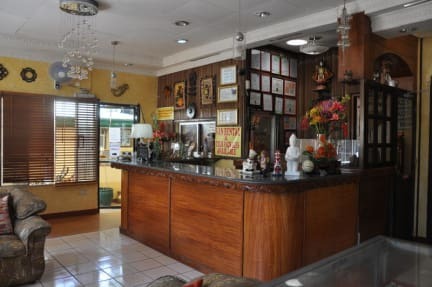 Believing that everyone is a familiar face, the staff at D'Lucky Garden Inn & Suites welcomes all guests with courteous service and personalized attention to details. The house features comfortable guest rooms, beautifully decorated with character and color. Our rooms are all air conditioned with private bathroom and TV. Other tours are also available such as Firefly watching tour, Dolphin watching during summer, batak tribe. Ugong rock, Elnido island hopping, elnido transportation. Car Rental with driver are also available. FREE Airport pick up for flights arriving between 6am - 5pm only.